Don't Judge a Book (or bar) by Its Cover. You know how sometimes a dessert isn't the most gorgeous thing in the world, but it IS the most delicious? 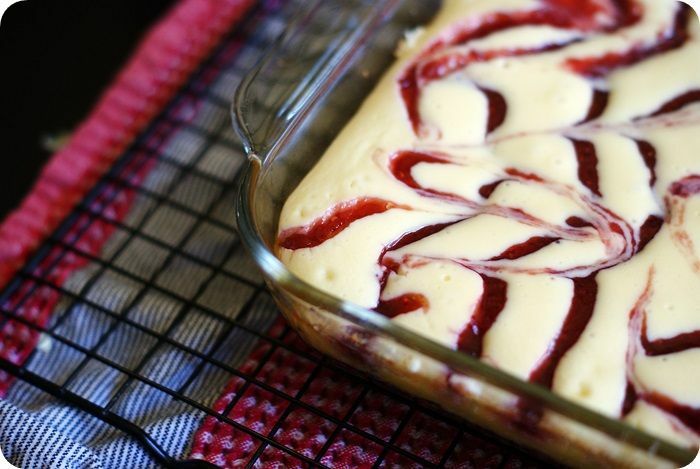 This is the case with these Raspberry Swirl Cheesecake Bars. Not that they're *ugly,* but they're not going to win any beauty contests, either. But ohmygosh...I could have inhaled the entire pan. Alrighty, so after giving the Oreos a good whir in the blender or food processor and adding some melted butter, you'll make a cheesecake filling. 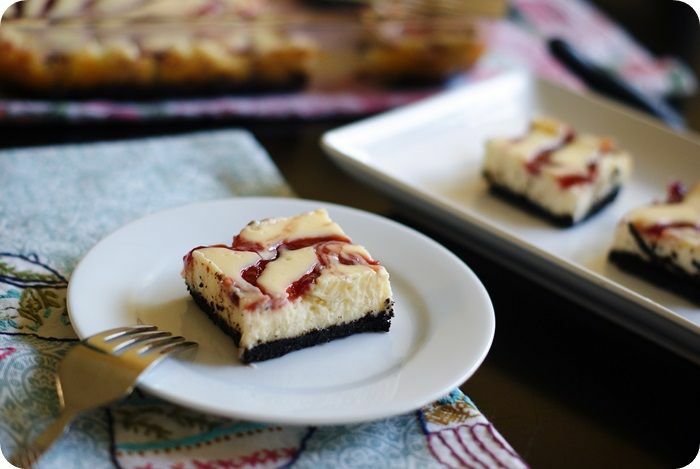 The cheesecake is flavored with vanilla and a touch of almond. I love that bit of almond. ...and swirl it all around. And then you eat. Cool, creamy, tangy, rich, and sigh. Never judge a bar by its cover, my friends. For the full recipe, click on over here. It looks pretty enough to me! I don't know what you're talking about. ;) That looks pretty yummy and good to me!!! Agreed with the other comments, it's pretty already! Also just popping in here to vow my love to birthday cake Oreo cookies, they are dangerous in my possession! That is so pretty!! anything swirled is bound to taste good! Oh boy!! Wow those look great and I do not normally like cheesecakes, but the oreos are winning me over! Looks perfect to me. I'll have to try it. Any dessert with an oreo crust is going to be a favorite of mine! Thank you for sharing! No way! I have never seen birthday cake oreos, but I can only imagine how long they would last around here ... like 10 seconds. These look perfect. I'm thinking Mother's Day would be a great time for a treat like this. This looks divine!!! Love the red swirls of the raspberry preserves! Oreo, raspberry, cheesecake... It's like a dream come true! Oh boy do these look good! I can't wait to inhale some! And they were sooooooo.. good! Universal hit at the household. As usual, your post was very entertaining. I giggled out loud at the part about the cream filling and kitchen walls. 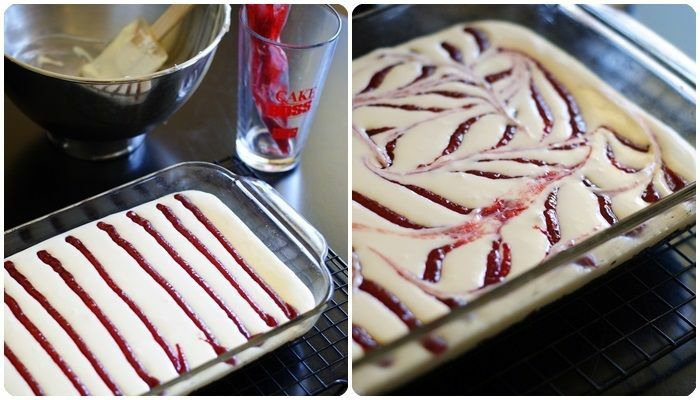 The raspberry bars looks tasty too! Does anyone know of any chocolate cookie on the market that does NOT have that creme filling inside? Hang onto to your skivies ladies because.....I do NOT like that super sweet cream type filling inside of those Oreo cookies. 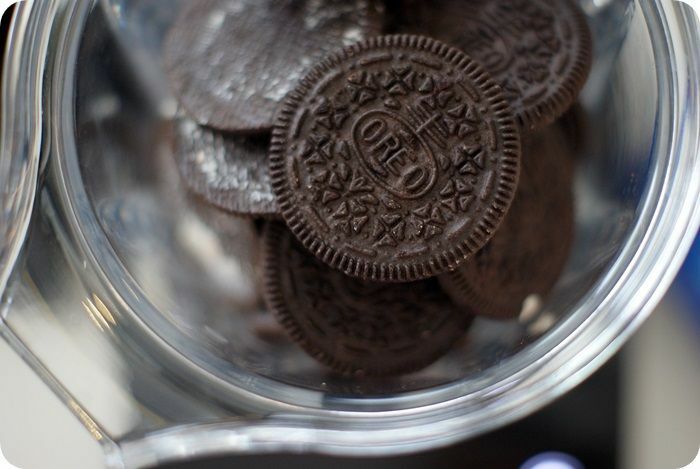 In fact, I'm not overly crazy about Oreo cookies at any time. Oh, I can eat one or two if I get in a very particular mood, but for the most part, I rarely ever eat any store-bought cookie. It's actually amazing that for someone who LOVES, I mean ADORES to bake the way I do I don't care to eat sweets all that much. There's only one cake that I will eat and eat several times a day if it's around. For one thing they now say I have Celiac disease which means I'm suppose to be highly allergic to wheat. Which, may explain much of this reaction to baked goods because this has been my attitude all my life. I can eat a little bit of them or bread or other carbohydrates but then I just don't want any more. And some things, such as pizza or donuts which are often made with a much higher gluten dough, will make me downright SICK. But, I still love to bake for others. I just rely on other people's opinions instead of my own. So if anyone knows of a chocolate cookie that can be used for a crust instead of tearing apart those poor Oreo cookies and just tossing the cream, I'll be glad of the suggestion. I think that these babies look SCRUMPTIOUS!!! Just wondering why you are removing the filling from the Oreo's before crushing? I have always just processed the whole cookie - filling and all. Am I the only one? :/ Helps hold the crumbs together for the crust too! Can't wait to try these looks really good to me! I do the same thing! I also think it adds flavor to the crust & makes a better consistency, and less work! Wow! 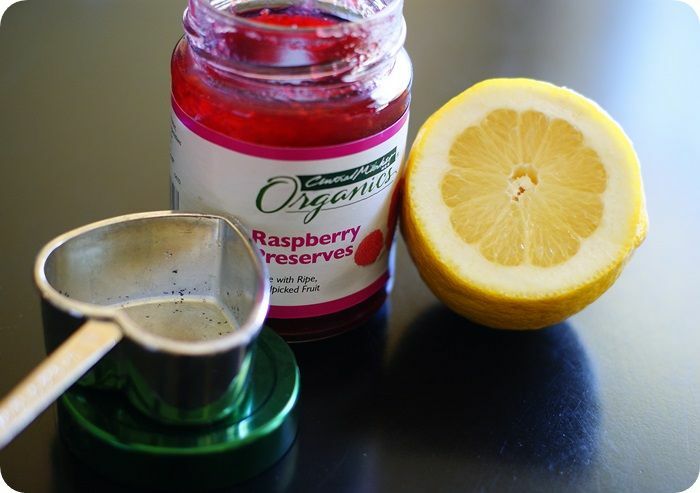 Raspberry and anything makes my mouth water. Can't wait to bite into this raspberry and chocolate creation. I think they're pretty! Like a I-wish-I-could-reach-through-my-computer-screen-and-eat-them-ALL kind of pretty. Yum. I don't know what you're talking about. These look lovely. I'm a big fan of the filling in oreos, but I always feel guilty buying them because they're made with palm oil. If anybody knows of a sustainable cream-filled chocolate wafer cookie, preferably not costing an arm and a leg, I'd love to give them a try. Are you kidding me? These turned out so pretty!! I think these look totally delicious and they sound amazing! 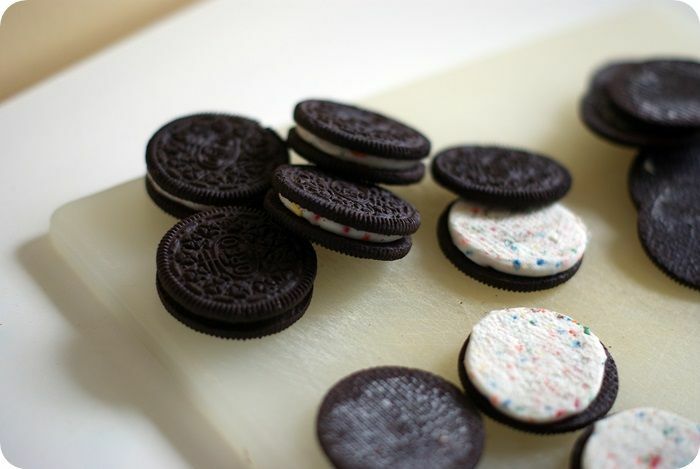 The funny thing is, being the non-Oreo creme lover that I am, I would probably just toss all of the creme from the middle. I could probably sell it though. ;) Anywho... you are funny, these look fantastic! 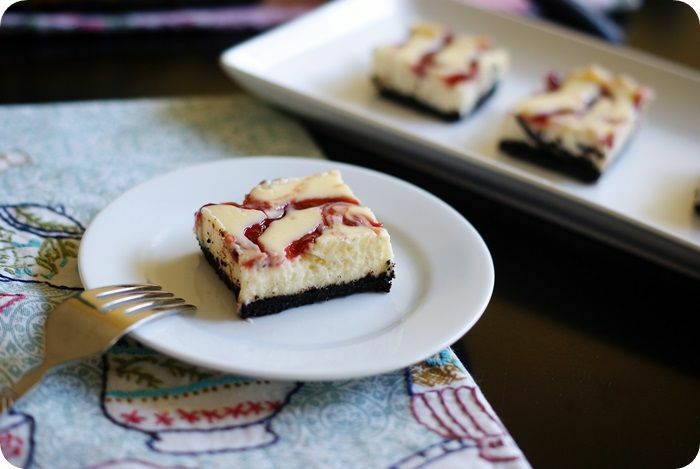 I don't even like cheesecake and they look delicious to me! that your child can imagine. Excuse me but where have I been? G would die if I made these for him! Seriously though, these are prettier than you give them credit for and I'm sure they're delicious.